It occurred to me that I should go ahead and make a post about this, seeing as how I have a few other Korea experience ones on the back burner because I haven't finished editing and uploading their accompanying videos yet. Most people probably do Seoul Tower in their first week or two, but I waited four months. On top of that, we went right when yellow dust season had just set in, so visibility was almost laughably low, and yet still good in a weird, desolate, post-apocalyptic sort of way. To get to Seoul Tower, take Line 4 to Myeongdong, Exit 3. Head toward the Pacific Hotel. I'm pretty sure you'll get to Namsan (the mountain the tower's on) just fine if you to to the left or right of the hotel; we went to the right even though this super informative tourist page says to go left. There'll be a set of stairs on your right after an uphill walk along a quaint narrow street, with the mountain, tower and cable cars visible in front of you. Go up, wait in line, and pay 4800 won for a one-way ticket or 6300 for a round-trip one. Walking up the mountain is a bit of a workout, and a pretty significant portion of the top bit is awkwardly large stone stairs. When we were headed back down, I passed a Korean woman whose legs had obviously stopped wanting to move just short of the summit. She looked at me, sort of embarrassed, and said "Oh, my, God! ", which is a very popular but sometimes still-effective phrase here. Anyway, Koreans walk up hills and stairs all the live long day, so if you're not used to that and not looking to reenact that scene from Rocky, just take the lovely cable car, where you'll be comfortably packed in with 43 other people. When we got to the top, there was a spacious open area with room for music and performances, food vendors (including Cold Stone), seating, and a very large painted wooden pavilion. There's also an entire section of fence and even a number of "trees" devoted to couples who want to attach locks to them, a custom that started on a bridge in Paris. You're supposed to stay together forever if you do it, so of course they sell little heart-shaped lock sets at the tower itself. We decided to get tickets for the observation deck and teddy bear museum (because who in their right mind would skip that) for a total of 14,000 won each. There are a few other options and you can even have an overpriced dinner in one of the restaurants at the top of the tower (much like you can at the Space Needle), but the food is supposed to be quite bad. I heard they put gravy on the steak. If you get a ticket for the bear museum, you have to go there first. I figured it was going to be a museum dedicated to the history of the teddy bear and assumed they were going to try to tell us that Koreans invented it. As it turns out, the semi-animatronic displays of bears tell you about the history of Korea. This one's a traditional court wedding. As Si said, "It's funny, we came in here expecting them to tell us that Koreans had invented the teddy bear, but as it turns out, the teddy bear invented Korea". Equally dubious, yet less insulting to the average visitor's intelligence. They're quite informative, really, and the romantic aspects are especially adorable when reenacted by stuffed bears. It's so gimmicky, but who knows, maybe it's a good way to teach people about history. Aww, the advent of electricity was so cute! When you head up to the observatory, you'll see a sign that tells you the elevator is the "World's Fastest" - despite the fact that a quick Google search reveals that it's not even in the Top 10 - but if you read the fine print, I guess it's worded to say that it's "the world's fastest in Seoul Tower". Derp. The ceiling of the elevator is a screen that plays a really cheesy, fun, Disneyland-esque animation to make it seem like you're shooting into space and out of the solar system. It'd be much better if it were accompanied by LSD and Jez's "This is Outraaaageoooous!" song from Peep Show. 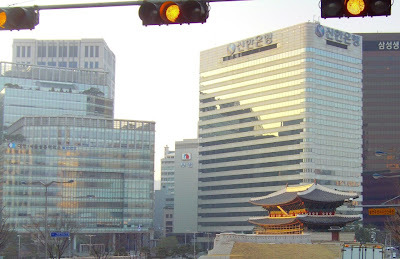 In the first picture you can see part of the original wall that encircled (what is now a small part of central) Seoul something like 700 years ago, and in the second you can see the shadow of the tower on the right. On a very clear day you can see all the way into North Korea. This yellow dust/haze view is obviously the other end of the spectrum. Here's more of that wall I mentioned, the one that also connects the four original gates to the old city. There's also the obligatory gift shop, but they do have a few really cute inexpensive things. It's either that or something really nice and extremely overpriced; no inbetween. I got a little tile pin with a cartoonish tower painted on it for about 1 USD. I also got a little racist. Coming down the hill/mountain was quite nice, as were the views at dusk. I didn't enhance these ones or anything; they just came out very yellow-orange. All in all, for an essential touristy thing, a visit to N Seoul Tower is a nice way to spend an afternoon. In a couple of months I want to go back at night time for a view of all the lights.